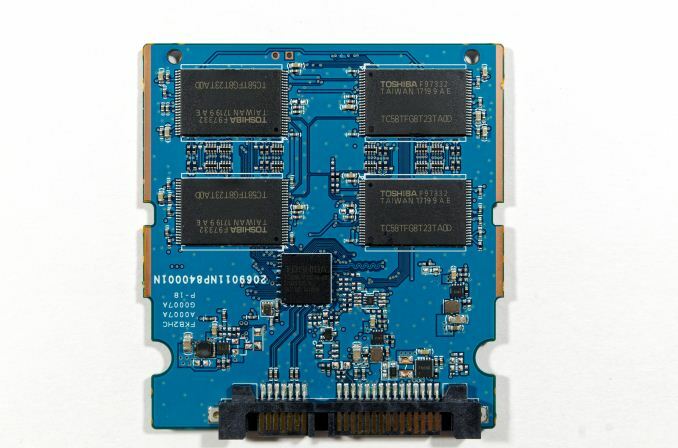 Toshiba's 3D NAND is finally coming to the retail SSD market in the new TR200 SATA SSD. After years of development, their BiCS 3D NAND technology is in its third generation and they've deemed it worth putting into mass production. Toshiba is now joining the club that Samsung founded and Intel and Micron joined last year. The many brands that use Toshiba NAND flash for their SSDs will now also be able to transition to 3D NAND from Toshiba's 15nm planar NAND. The TR200 is the successor to the Trion 100 and Trion 150 SSDs, the latter of which was renamed TR150 earlier this year. The Trion/TR series has been Toshiba's entry-level SSD line since their acquisition of OCZ. The Trion 100 was Toshiba's first retail TLC SSD. In moving away from MLC NAND flash, the Trion 100 sacrificed performance and write endurance for the sake of affordability. The Trion 150 moved the lineup to Toshiba's 15nm TLC and delivered increased performance and lower prices. With the TR200, Toshiba is again making major changes that sacrifice performance for lower prices. We've seen with the Toshiba XG5 OEM NVMe SSD and with Western Digital's 3D NAND SSDs that the 64-layer BiCS3 3D TLC NAND doesn't have a performance problem. What slows down the Toshiba TR200 is the switch to a DRAMless SSD controller. The Trion 100 and Trion 150 both used Phison's S10 SSD controller under Toshiba branding. The TR200 uses Phison's S11 controller, a substantially smaller and cheaper controller, but also more modern with official support for 3D NAND and LDPC error correction. Where the Phison S10 was an 8-channel controller built on a 55nm process, the S11 has a mere two channels and is fabbed on a 40nm process. The S11 controller's limitations mean we won't be seeing a 2TB model added to the TR200 family. The direct successor to the Phison S10 will be the S12 controller, but it isn't quite ready to hit the market. Toshiba has said they plan for the TR200 to be their only retail SATA SSD to use the 64L BiCS3 3D TLC, so we don't expect an S12-based drive from Toshiba to show up anytime soon. Instead, it appears that Toshiba and their somewhat estranged manufacturing partner SanDisk will be going after different ends of the SATA SSD market. Officially, Toshiba doesn't tell us much about the specific chips in their SSDs. They never officially confirmed that the earlier Trion series SSDs were using the Phison S10 controller despite an identical PCB layout to competing Phison drives, and they haven't confirmed that the Phison S11 is what's hiding under the Toshiba markings in the TR200, but the firmware version numbering matches other S11 drives. The secrecy also applies somewhat to the NAND configuration. Officially, both their 256Gb die and 512Gb die are used in the TR200 series. Unofficially, Toshiba seems to have done little to change their part numbering scheme over the past decade, so it looks like the 960GB TR200 is the only one using the 512Gb parts. This means that the 960GB model doesn't have much potential for a performance advantage over the 480GB model, because both have a total of 16 NAND flash dies spread across the controller's two channels. 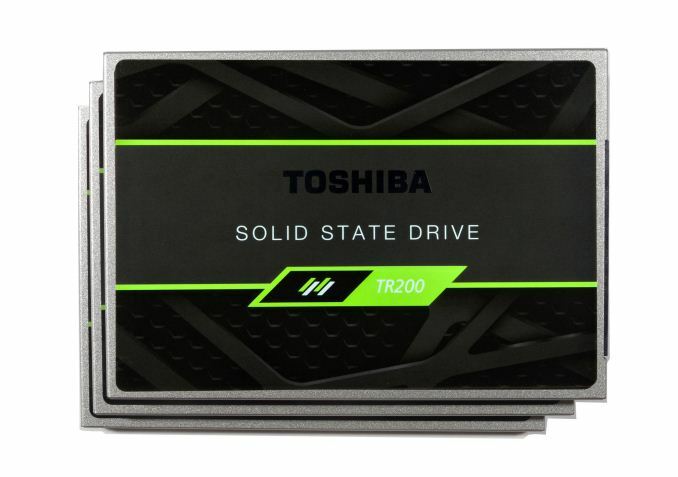 The construction of the Toshiba TR200 is very similar to other recent Phison SSDs, but the labeling is very different from the Trion 100 and 150. Toshiba has been phasing out the use of the OCZ brand, and the TR200 drops all use of the name from the drive itself, though OCZ is still mentioned on the box. The drive does still have an OCZ logo, though the color scheme has switched from blue and white to green and black. As can be expected from a DRAMless SSD, the PCB inside doesn't take up much space, even with Toshiba using just one or two NAND dies per package. There are four packages on each side of the PCB, each of which dwarfs the controller package and all the smaller components. The MSRPs for the TR200 aren't groundbreaking and are in fact much higher than what the Trion 150 was going for when it was new, but that's due to the NAND flash shortage that has driven prices up over the past year. When the Trion 150 launched, the best deals were around 20 ¢/GB. Now, 27 cents/GB is hard to beat, and the MSRPs for the TR200 start at 30 ¢/GB. With the Trion 100 and Trion 150, Toshiba kept prices fairly competitive, though usually not quite the lowest on the market. They'll probably do the same with the TR200, and may be a bit more aggressive given the cheaper DRAMless design. Now that Toshiba's 3D NAND is showing up in volume, the situation should improve. Intel/Micron and Samsung are also ramping up production of their respective 64L 3D NAND, and SK Hynix might return to relevance if their 72-layer 3D NAND ends up affordable and readily available. There's no definite timeline for prices getting back to their 2015/2016 lows, but the price increases are probably pretty much over now. As a DRAMless SSD, the TR200 doesn't quite fit in the same market segment as most of the entry-level SSDs from Toshiba's competitors. DRAMless SSDs haven't been very popular with the major SSD brands of the North American and European markets, because they have historically not offered enough of a discount to offset the performance hit. Nonetheless, the Toshiba TR200 will be in close competition with drives using larger controllers with DRAM. The Crucial MX300 and ADATA SU800 are two examples, based on Micron's 32L 3D NAND and controllers from Marvell and Silicon Motion. Samsung's 850 EVO has long overshadowed a sizable chunk of the SATA SSD market with performance close to the limits of SATA, and lately it has been priced very aggressively. For comparison with other DRAMless SSDs, we have few options. The only DRAMless TLC SSD we've tested lately is the HP S700, based on the Silicon Motion SM2258XT controller and Micron's 32L 3D TLC. We also have the Toshiba OCZ VX500 with 15nm MLC NAND, which uses a small external DRAM cache on the 1TB model but none on the smaller capacities. Maxiotek (formerly JMicron) has their MK8115 DRAMless controller, which has been adopted with Micron 3D TLC for the ADATA Ultimate SU700, but we haven't tested that product. We previewed that controller earlier this year with engineering samples from Maxiotek, but those results are from our old 2015 test suite instead of the current 2017 suite. Cudos to toshiba for making an ssd that is as slow in sequential writes as a mechanical hdd. I can't imagine it was easy. At 1/10th the power consumption though. As hard as it is to defend this drive, it’s clear toshiba had a very specific goal in mind with this drive: cheap upgrades for cheap laptops. As an OEM supplier for many vendors (including even Apple) this drive is adequate for many sub-$500 laptops: being dramless makes power loss protection mostly unnecessary as it will likely recover from sram loss inside the controller, as the indirection table is mirrored off then back to the nand after each write. 3 most valued SSD models currently on Amazon. One of them is the BX300 with capacity max out at 480GB which I can only compare it to the similar of the other 2.